How do you circle a moon? It may initially seem premature to worry about the spacecraft’s path and orbit upon arrival at Mars. But the science and engineering goals for the mission are both precise and challenging, frequently requiring the spacecraft to be in a particular location or orientation with respect to Mars, the moons, the Earth or the Sun. As a result, we need to consider our route through Martian space early so that any structural or operational requirements will be reflected in the spacecraft design. 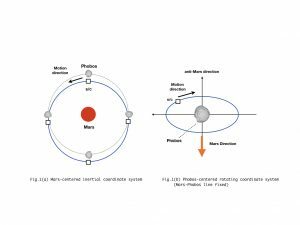 Welcome to the Martian Moon eXploration (MMX) Mission blog! Here we will share news and activities from our pre-project team as we investigate what we need to explore the Martian moons and return a sample to Earth. Our plans and the mission details may change in the future as we gather more information, and you can follow this progress here and on twitter. The cherry blossoms are in full bloom all over the place 🌸. When we sent a photo of JAXA’s cherry blossoms to a friend at NASA, they sent photos back! Here are cherry blossoms taken at NASA and JAXA: can you tell which is JAXA? At 10:45am JST TODAY, the ESA/JAXA @BepiColombo is lifting off for Mercury! Stacked up tight are orbiters “MIO” @JAXA_MMO & “Bepi” @ESA_Bepi. Safe flying 🛰!